Choose a 34m² Executive Room at the Hilton Athens hotel and enjoy an array of executive privileges such as private check-in at the Front Desk, and access to the plush Executive Lounge, including a complimentary continental breakfast, snacks and refreshments throughout the day. 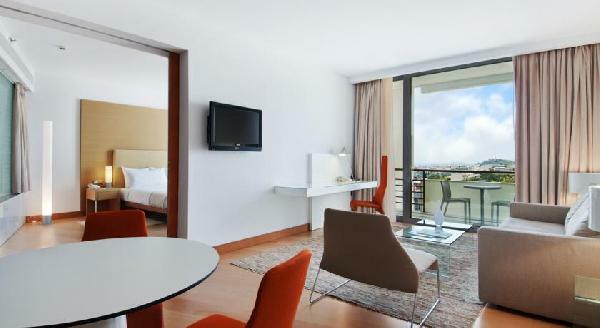 Available with either one king-size or two twin beds, your Executive Room at the Hilton Athens hotel features a spacious balcony with spectacular views of the Lycabettus Hill, and is perfect for frequent business travellers seeking comfort, convenience and a uniquely personal service. Catch up with work at the desk and ergonomic chair, check your emails with high-speed internet access, or unwind on the sofa and watch an on-demand movie on the LCD TV.